Lexington, KY (May 24, 2017) - For the first time ever, American Flat Track will race in Lexington, Ky. at the Red Mile on Saturday, June 3. With roots dating back to the 1920s, American Flat Track is America&apos;s original extreme sport. While not quite as storied as Red Mile&apos;s 142 year-old harness racing history, American Flat Track and widely regarded as the most prestigious and competitive form of dirt track motorcycle racing in the world. Mary Catherine White, Red Mile&apos;s Director of Marketing and Special Events explains, "We have a long history of hosting exciting events in addition to world-class harness racing, and AFT is no exception. We were thrilled to come on board with such an exciting organization. 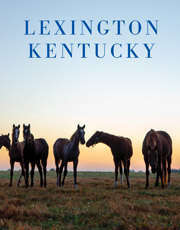 It should be a beautiful day in the heart of Lexington - full of racing thrills and entertainment for the whole family." Doors open to fans at 2:00pm on race day. Once inside guests can enjoy delicious offerings from various Red Mile concessions throughout the facility, as well as from Buddy&apos;s World Famous, Whoo Wants Waffles and more, who will be on hand serving up their food truck fare. Local breweries - Country Boy and West Sixth will be set up in the Red Mile beer garden pouring delicious cold craft beers. London, Kentucky based band Frontier will play in the Indian Motorcycle Lexington Fan Zone from 3:00 - 6:00pm, as well as during race intermissions. The Strider Adventure Zone, open from 2:00 until 6:00pm is a free ride and play area for children 12 and under. In the safe and friendly area, children as young at 18 months can learn to balance and ride on pedal-less bikes. Throughout the day two Strider bikes will be given away. Motorcycle displays from Vance and Hines, Man O&apos;War Harley Davidson, Indian of Lexington, and Gateway Cycles will keep the adults entertained before racing begins just after 6:30pm. Throughout the evening, leading up to the main event, Central Kentucky Flat Track fans will get to witness a new level of excitement in heat and semi races as the best riders in the world mount their fire breathing AFT Twins (90+ horsepower), along with the future of the sport in the AFT Singles (up to 60 horsepower) class, and duke it out for bragging rights as the first ever winner on the Red Mile track. In addition to watching the thrilling on-track action, fans are also invited into the paddock from 4:30-5:30 to meet the stars of the sport and watch the crew chiefs and mechanics at work. The last time the series raced in Kentucky was on June 8, 1991 in Louisville. Scott Parker secured the Half-Mile victory on a Harley-Davidson, on his way to claiming the fourth of his nine Grand National Championships, over eventual seven-time champ Chris Carr. Tickets are on sale now both online, and locally, and at a discount at Indian of Lexington, Man O&apos;War Harley-Davidson, and Wildcat Harley-Davidson. With valid I.D. all military and first responders receive 50% of general admission tickets. College students also receive a 50% discount with valid I.D. Children 12 and under receive free general admission with adult ticket purchase. Hospitality Suite tickets that include indoor seating with spectacular lower level views of the track, catering, and cash bar are also available. Event parking is free, including a dedicated motorcycle parking zone. Please contact Alex@KindlingPR.com for hi-res photos, or to arrange a media pass or live shot. Since 1875, Red Mile has been an important part of the cultural and physical fabric of Lexington, Central Kentucky, and the world of horse racing. A $42 million joint venture with Red Mile and The Keeneland Association features the trifecta of racing offering live racing, simulcast wagering and 900 Instant Racing® terminals. The expansion and renovation of the all-new Red Mile features 110,000 square feet of entertainment and expanded wagering options.